Find out how you can outperform the competition and accelerate success by becoming a digital-native enterprise (DNE). 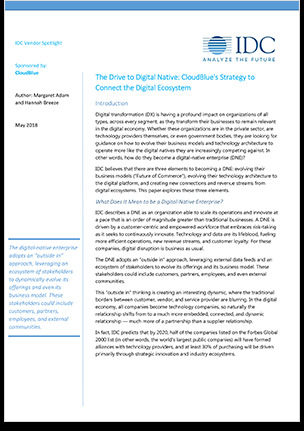 Get this IDC research report – The Drive to Digital Native: CloudBlue's Strategy to Connect the Digital Ecosystem – and explore our three-pillar approach. You're already competing against DNEs. Isn't it time you evened the playing field? Go digital native with your free copy of this strategic IDC report.